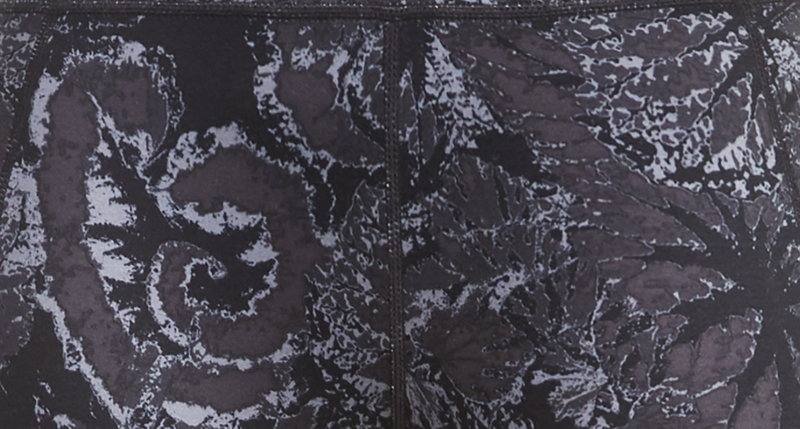 Get it om in these reversible yoga leggings you can wear two ways. 100% opaque, super soft and stretchy wear these print side out to get down dog before reversing to black for drinks with the girls. An adjustable drawcord at the high waistband ensures the perfect fit. Reversible High Waisted Yoga Leggings is rated 4.6 out of 5 by 17. Rated 4 out of 5 by Namasteff from Cute design, heavy fabric I love the design of these leggings and have worn them to spin, HIIT, and yoga (they’re a little thick for hot classes, even with the mesh panel). The fit is mostly great, though it doesn’t hold me in at the hips and thighs quite as well as Lululemon and Alo. I was surprised that the black size of these leggings shows sweat during intense workouts - I’ve never experienced that with black tights before. Otherwise, they’re great! Rated 5 out of 5 by LS1320 from Great quality fabric I love the material. I don’t mind that these are thicker than average, it seems like they will last. Rated 5 out of 5 by Vern from Simply the Best! I am in love with this brand! These leggings are so soft, comfortable and cute. High quality is very apparent in the way these are made. They fit great and make me feel like working out! I am 5'3" and about 100 lbs. In their bottoms I get the xxs. If you are considering a Sweaty Betty purchase, don't hesitate you will not be disappointed.